We’re going to do something a bit different in this post. It’s a departure from what we typically publish here on the MemberMouse Blog. But hey… here’s to mixing things up a bit! As a team, we were recently able to participate in something special. We want to take you behind the scenes and tell you all about it. Last summer, we connected with two of our long-term customers – Andrew and Pete – after hearing them talk about content marketing and memberships on a podcast. If you’re not familiar with Andrew and Pete, they’re content marketing experts, teachers, and international keynote speakers. They run the UK’s leading content marketing membership community called ATOMIC. They teach entrepreneurs, marketers, and business owners how to get results and succeed with content, email, and social media marketing. After connecting on Twitter, we hopped on a call and learned more about them and their business. After talking with them, we thought they would make great guests for our podcast. And sure enough, they did! You can check out the episode we recorded with them here. Little did we know that this informal chat would lead to some pretty amazing things down the road. You see, after we got to know each other, Andrew and Pete told us about a secret project they were working on at the time called ATOMICON. They had been successfully running their membership site for years and had spoken on some of the biggest stages of the digital marketing space, like the Social Media Marketing World, CMA Live, and Content Marketing World conferences. Then last year they decided to try their hand at hosting their very own marketing and business growth conference. Thus, ATOMICON was born. The opportunity that came about from all this was that Andrew and Pete asked us if we’d be interested in participating as sponsors of the event. Right away we knew we wanted to be involved on some level with their conference. I mean, how cool is it that we had the opportunity to support two members of our community with their, biggest, boldest, and bravest venture yet? They Want Us to Make a Video? But there was a catch… well, sort of. One of the opportunities that came along with being a sponsor of the event was that we could create and show an “ad break” video to all of the attendees at conference. Gulp…! While we’ve certainly made a lot of videos detailing all of the different features and functionality of our platform, we’ve never really made a “traditional” advertising video for MemberMouse. Fortunately, Andrew and Pete were there to guide us and help us create something memorable. Now, the thing you need to know about Andrew and Pete is that they are a fun, goofy, and highly entertaining duo. They really know how to create memorable content and stand out amongst all of the noise and chaos on the internet. So, going into this we knew we had to up our game and create something unforgettable. After a few brainstorming sessions, we thought it would be fun to tell a fictionalized version of how Andrew and Pete joined MemberMouse (you’ll get what we mean by fictionalized a bit later in the post). After Eric recorded and edited the mockup video, he sent it over to Andrew and Pete to review. They hopped on a call and watched the video. This was a little nerve-racking for us… We had put a good amount of time and effort into this. Andrew and Pete are the content marketing experts and this is their conference, after all. We wanted them to like the video and give us the assurance that the conference attendees would enjoy it as well. As you saw in the video, Andrew and Pete ultimately thought it would be funnier if Eric actually acted out all of the different parts himself in the final video. As absurd of an idea as it seemed initially… we all agreed that it would be funny, memorable, and immensely entertaining. So, Eric tasked himself with creating the final ad break video. In the end, he ended up playing 6 different roles, filming and editing the video entirely his own. And how did the video turn out? We won’t keep you in suspense any longer. Now that the video was done, Eric was ready to pack his bags and hop across the pond for ATOMICON. He flew into Newcastle Upon Tyne last week, ready to attend ATOMICON and share the video with all the attendees. The conference was an amazing success and the video we created was well received by the audience. We’re so proud of Andrew and Pete for successfully pulling off their very first conference and we’re grateful for the opportunity to support them in this endeavor. Alright, so day one is done. The event was yesterday and it was amazing. Andrew and Pete did a fantastic job on the event. Now let’s talk about the content for a little bit:To me there is one way of looking at it. There could be two broad categories of content. There could be informational content and inspirational content. Both types are valuable. Informational content is stuff that helps you. It’s data and it tells you how to do something, how to implement something. You can take actions based on information. I think informational content is widely more prevalent than inspirational content. The thing is, if you had information without inspiration what happens is you don’t do anything. You get the information and then you have nowhere to go from there. You need something else that’s going to help motivate you to take a step, do something. Lao Tzu said, “the journey of a thousand miles begins with one step,” right? If somebody tells you informationally “this journey is a thousand miles”, well most of the time when you hear something like that you respond with, “oh my God, all these obstacles. What if I don’t have the right shoes? What if I don’t know the directions? We end up keeping ourselves from taking that first step because we’re so daunted about imagining what the whole thousand steps is going to be. Of course, the key is it’s an imagination. We are psyching ourselves out. Inspirational content bypasses this. Information you can get into these whole analysis/paralysis situations. With inspirational content it’s kind of like a magician. It goes behind the intellect and lights a fire for you to do something without you necessarily knowing why. You can end up reading a million articles, you can end up going to thousands of events, but if you don’t get inspired to do something you’re just going to be repeating a cycle and not actually going anywhere. The only thing that’s important in terms of understanding where you want to go and where you want to get to is what you want, personally. Where do you want to go? It’s not where somebody else says you should go, or what society says you should be doing. It’s where do you want to go? That’s the most important thing. If you know that, then anything that could help you get from where you are now to where you want to go is of value, in my opinion. This long thing that I am saying is – one of the things that I think was really prevalent in this event is inspirational content. There was certainly informational content, but the fact that there was inspirational content means that a lot of the people who were there, the three hundred plus people who attended this event, they’re actually going to do something. The first step is the hardest step to take. We have so many fears and objections. That was the umbrella theme of the event that they started off in the beginning: facing fears. I personally think is amazing to be doing at an event like this because this topic doesn’t get enough attention in the business world. When you get used to the process of facing your fears. First of all, you realize what you were calling your fear is not a fear. It’s just a feeling and a sensation that you get when there is something new. There’s something new here that I’ve never done it here before and I’m unsure. There’s a feeling associated with that and we can label it as fear, but we can also label it as other things. The label is not important. The fact is we feel it and it’s something that is a resistance. To me, you could call a fear, but you could also call it a growth. That to me is the process of growth. You think of a seed that starts sprout. If that seed could have the mind of a human, would that be a comfortable process for it? In some ways it’s violent. Breaking a shell open, it’s sprouting this thing. It’s growing and stretching. That could be uncomfortable. That’s how it turns into a tree. Yes, we want to face our fears and build that muscle, but in time realize that this is just a part of life. They’re not fears. It’s just a natural sensation that happens when we’re doing something new. Let me just “fail forward fast.” We’ve all heard this. This is a great saying. Just get it out of the way. Just do it because as soon as you’ve done it you are now on the path of growth. I feel that in that spirit it, it then unlocks the community and how the community can help each other. Conversations start that otherwise wouldn’t have started because you’re recognizing that we’re all in the same boat. It doesn’t matter that we have 300 different people, 300 different destinations that we’re going. It’s going to look different, but what we’re going to have to go through and what we are going to have to face is exactly the same. It’s really no different. So, we want to congratulate Andrew and Pete on a successful launch of their first conference ATOMICON. We can’t wait to see what you two do next year. We hope you enjoyed this post and video which is a little out of the ordinary for us. 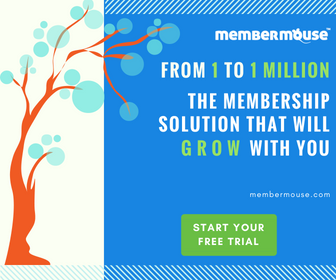 Our blog posts normally focus on helping you build successful businesses with MemberMouse. So, it was fun for us to pull the curtain back a bit and show you a little bit of what went on behind the scenes for this event. We’d love to hear any feedback you have on the video! Let us know what you think in the comments below.